The total cost with shipping included was US$189.00. The belly pan was out of stock when I ordered. I knew that before ordering and the website clearly told me I might have to wait 28 days for availability. In the end, it took about 14 days before the product was available and another week for the delivery to arrive in California. Upon pulling the parts out of the box, I was horrified to see that there appeared to be nicks and scratches all over them! What I couldn't tell through the plastic bags that contained the parts is that there's a thin protective film over the pieces. It was the film that was damaged, not the parts. Once I pulled the parts out of the bag and removed the film, everything was in perfect condition and all of the necessary mounting hardware was there. Installation only took about 15 minutes. 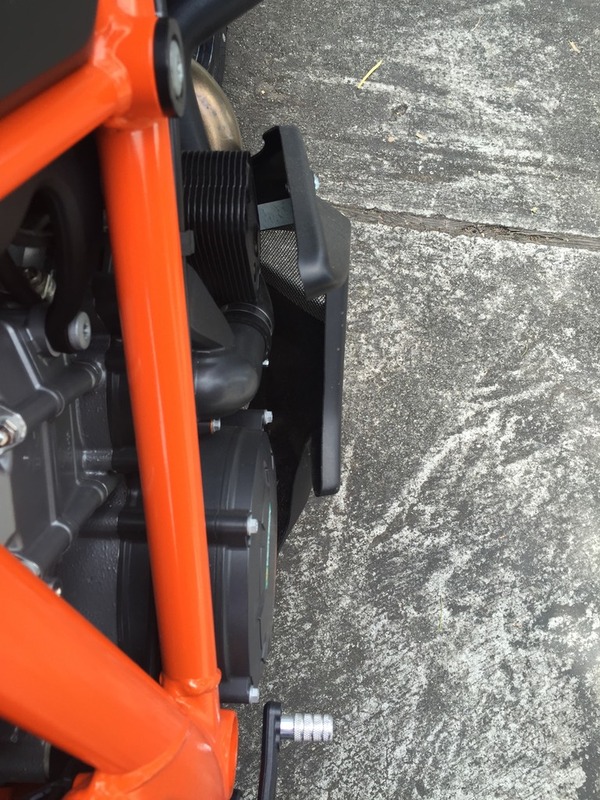 There are four brackets that have to be installed, two on each side of the bike. Two of the brackets look very similar so make sure you know which one is which before beginning! 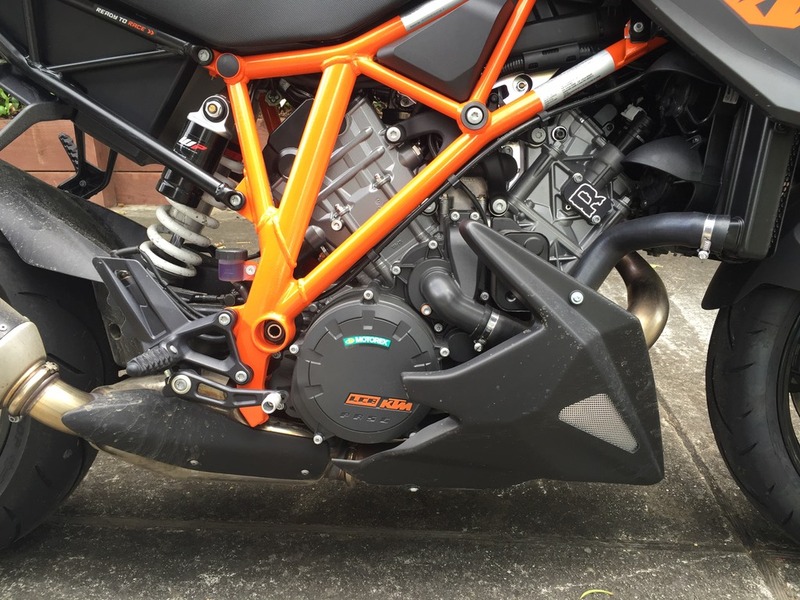 Once the brackets are installed you bolt the two pieces to a V-shaped front bracket, bolt the whole thing to the brackets you mounted to the bike earlier, and then tighten everything down. Getting some of the necessary nuts and bolts in place will be tricky if you don't have small hands, but the whole process isn't too bad. If the nuts necessary to secure the fairings were an integral part of the mounting brackets, installation would be much easier but I guess having separate nuts, bolts, and brackets keeps costs down. 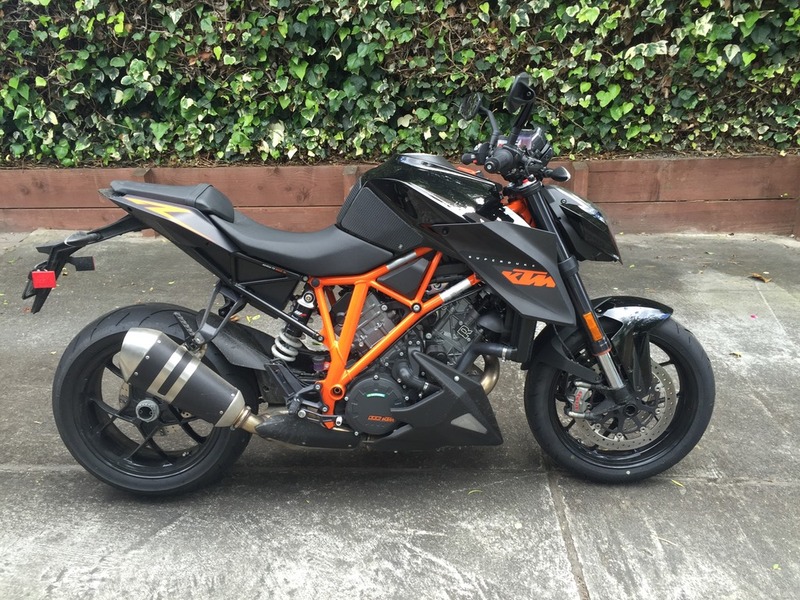 I was pleased to see that the matt black color of the pieces was a good match for the matt black color of my black SuperDuke's upper fairing. I think the silver mesh looks good, though I have to admit that I'm tempted to paint it KTM orange so that it integrates with the bike better. The gold mesh might have been a better match for the bike than the silver mesh, but I couldn't find any pictures of it so I wasn't willing to take a chance. The raised PowerBronze decals shown on their photos of the belly pan are included on a sheet of backing, so you don't have to install them if you don't want them. It will be obvious if you look at the pictures on the PowerBronze website but this "belly pan" doesn't actually include a "pan"; the bottom opens directly to the ground below. A better name for the product might be "lower fairing kit". I wish the panels were tucked a bit closer to the frame, but given that there's no padding or heat reflective tape on the pieces I'm sure they were worried about them over-heating or rattling around if they were closer. I don't mind this (much) but it unquestionably reduces ground clearance. If you're a track junkie or knee dragger, this probably isn't the accessory for you! The panels seem flexible enough that you might be able to bend the brackets and reduce the size of the gaps slightly. I haven't done this, however, so try it at your own risk! I must say i am not happy with the distance they have made it from the motor on either side and am presently modifying it and the brackets are flimsy,not sure how long they will last before fatigue gets them overall i would not recommend it to anyone. For the money and the wait it is not worth it,mine came from UK and i am is AUST and took more than 2 mths. The brackets I received were more than capable of supporting the weight of the light-weight fiberglass pieces attached to them. 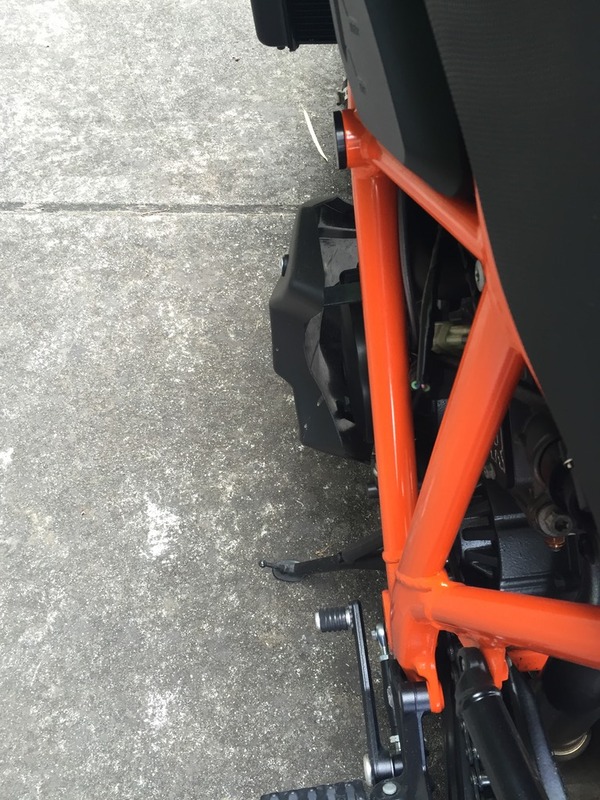 I wouldn't expect the two larger brackets to be capable of supporting the entire weight of the bike, so if you crash or drop the bike on it's side they may bend out of shape. Barring that, I would expect them to last as long or longer than the fairing pieces. I agree with your review, nice product and I think does enhance the bike. I've done around 6k miles and have no quality issues, the only thing I could add is that there's a fair bit more heat directed up from the exhaust, not a problem just a difference from before. I did gently push with the palm of my hand the bracket areas after fitting to close the gap a bit and tighten the look. The plate between the sides behind the wheel is steel, after getting stone chipped off the tyre it then rusted quite badly due to the very thin paint finish. I shot-blasted and painted it but next time around I'll make an alloy one. I may have moved on by then ?? Which exhaust is that on your bike?